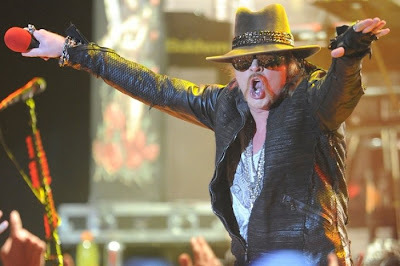 A June 2012 performance at London, England's O2 Arena by Guns N’ Roses will be broadcast on VH1 Classic on March 9 as part of a 5-hour GNR special on the station. The night will kick off at 8:00 p.m. with a one-hour, all-GNR video block hosted by "That Metal Show"'s Eddie Trunk, followed by the London concert and a rebroadcast of the Axl Rose "That Metal Show" episode. The big-screen premiere of GNR’s 2012 performance at O2 Arena was scheduled for last October at select theaters in Europe but was "postponed" by the band's management. A trailer of the concert can be viewed below. GNR kick off an Australian tour with ZZ Top and Rose Tattoo on March 9 in Perth.